This season, 2017-18, marks the 50th season of the club. We plan to mark this achievement in several ways. The period 5 – 12 May will see a week of events which includes a special Exiles Weekend and the hosting of the Ulster Juniors v. Leinster Juniors Interprovincial game. Exiles rugby games starting at 1.00 – 1st XV v. President’s XV, 2nd XV v. Exiles 2nds, UUC Women v. Exiles plus a TAG game for those averse to contact! As of old, a beer tent will be in place during the afternoon and afterwards. In the evening a Gala Anniversary Dinner is to be held in the University, meeting in the student bar at 7.15 for 8.00 pm. This event welcomes all current and former players plus girlfriends, partners and wives who wish to attend (including those with Ladies Hockey connections). The cost is £35 per head. Someone has been approached to act as a catalyst to ‘round up’ as many of your era as possible. Please spread the word to others. We want to make this a night to remember! Initially, we hope that you will be contacted by your peer rep. who will sort tables and provide us with names, numbers and emails. The club will then be in touch before 1 April for confirmation and payment. However please contact Brett (rugbybrett@hotmail.co.uk) or Alan (AW.McCully@ulster.ac.uk) if no one has been in touch. A mixed TAG participation event open to all students (and others). Ulster Juniors v. Leinster Juniors, 2.30 pm, The Sam Logan field. Should you be interested in sponsoring any aspect of the 50th celebration please get in touch with Alan or Brett. We want to see as many of you at Exiles weekend as possible! 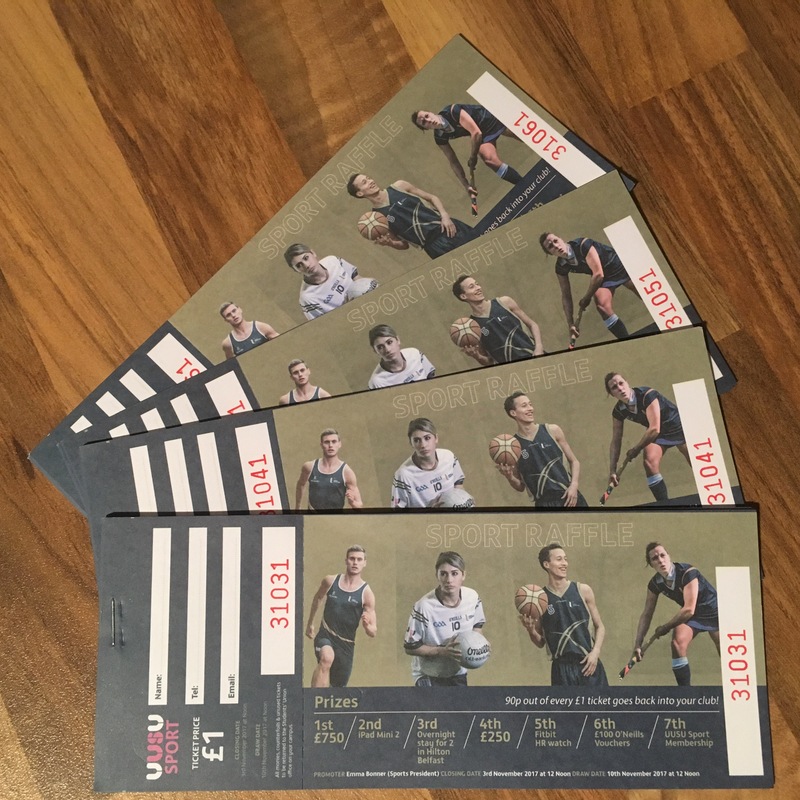 It is UUSU Sport Raffle draw time again so can I ask you to support the club once more?The draw is designed to help clubs raise funds for their own use. Books of tickets cost £10. All the money for tickets sold by the rugby club comes directly to the club. Exiles of the club will benefit from an additional prize draw and the winner receiving a UUC RFC Polo Shirt. To purchase tickets contact the page for more details. Yesterday the guys went to Dublin to defend the Maugh-Scally Cup. The team came up against UCC Rugby Football Club in the group stage overcoming them with a 30-0 win. 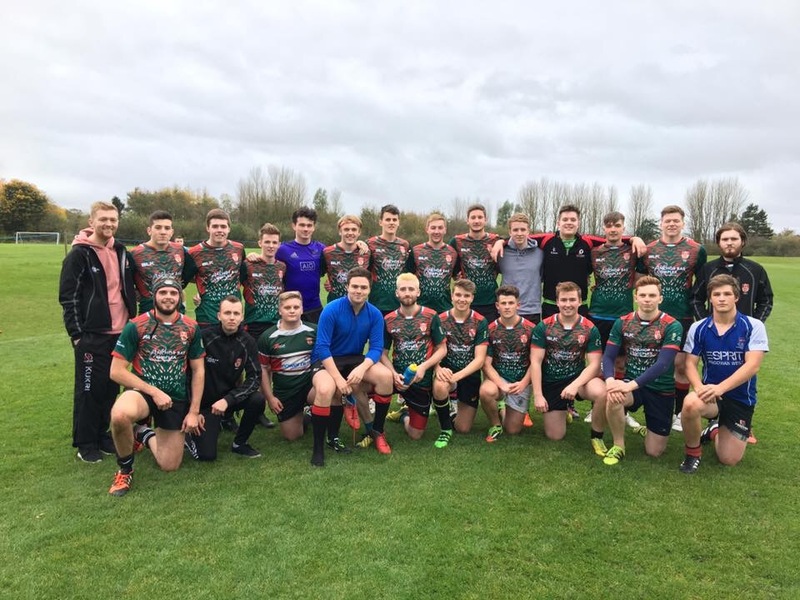 In an all Ulster final UUC came up against Queens University Belfast Rugby Football Club (QUBRFC). In the end, without conceding a point all day, UUC defeated Queens 14-0. Do you play rugby? Or Interested in learning the game? Do you want to make new friends? Want to have fun whilst doing all this? If you answered YES to any of the above questions then we at UUC RFC can help you. We welcome all players male and female to our club, from those who want to take the game seriously to those who want to learn how to play, we can help you develop your skills in rugby. Already play for your local club team? Not a problem, as you are a student you qualify to play in the University Colleges matches, these take place on a Wednesday, in these matches you come up against other university’s throughout Ireland. 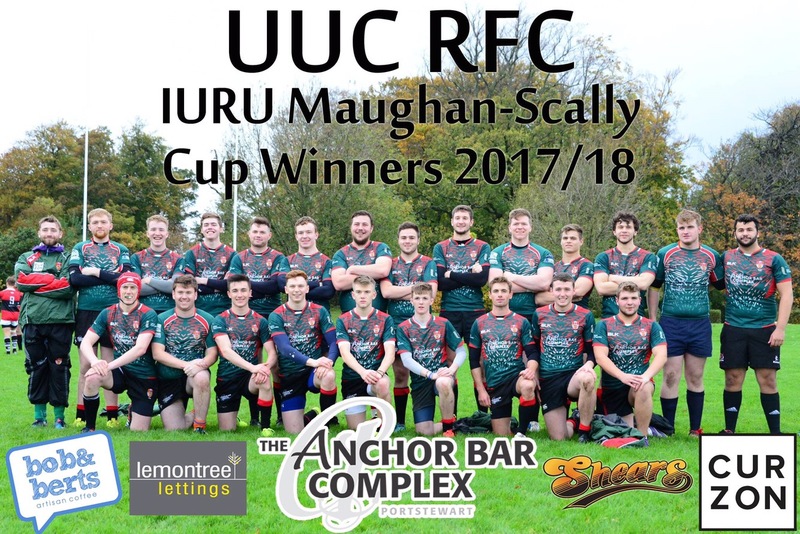 From Jordanstown to IT Sligo to Maughan-Scally IURU cup in Dublin. Our representatives will be about the University during the Freshers fair, feel free to come along and chat about joining us. 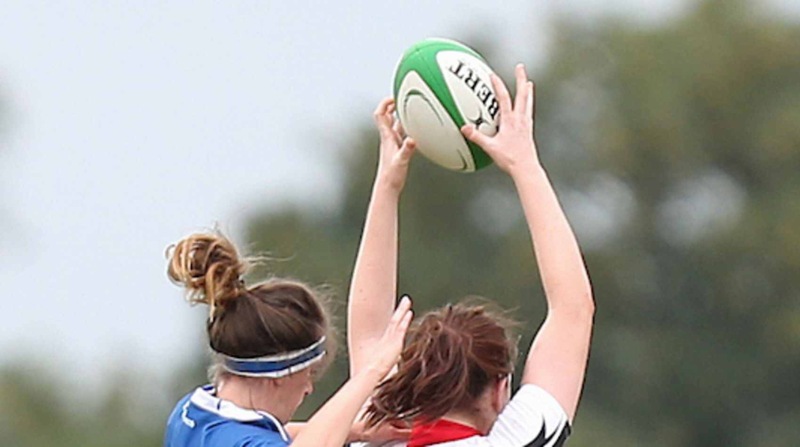 Ulster Rugby in conjunction with Ulster University and Queens University Belfast are introducing female rugby festivals over the coming months. The festivals are open to any third level education students aged 18+. Dependent upon numbers attending, the festivals will either use a cross-field 7-a-side format of the game or a full-pitch 10-a-side format. The events are not just for experienced rugby players as there will be Ulster Rugby coaches on-site to work with any novice players that fancy giving the game a try using a touch format game to help build confidence. Once the rugby is finished the plan would be that players would enjoy the host venue’s local Wednesday night social scene. If you would be interested in attending the first festival on 8th February please register using the Eventbrite link below. If you are concerned about transport, there will be people travelling so we can do our best to get you there just get in touch with Neal Johnston at Ulster Rugby on 07767 115 764. Last week saw the official presentation of new BLK playing tops for the 1st XV from Danny Coyles of The Anchor Bar Complex. 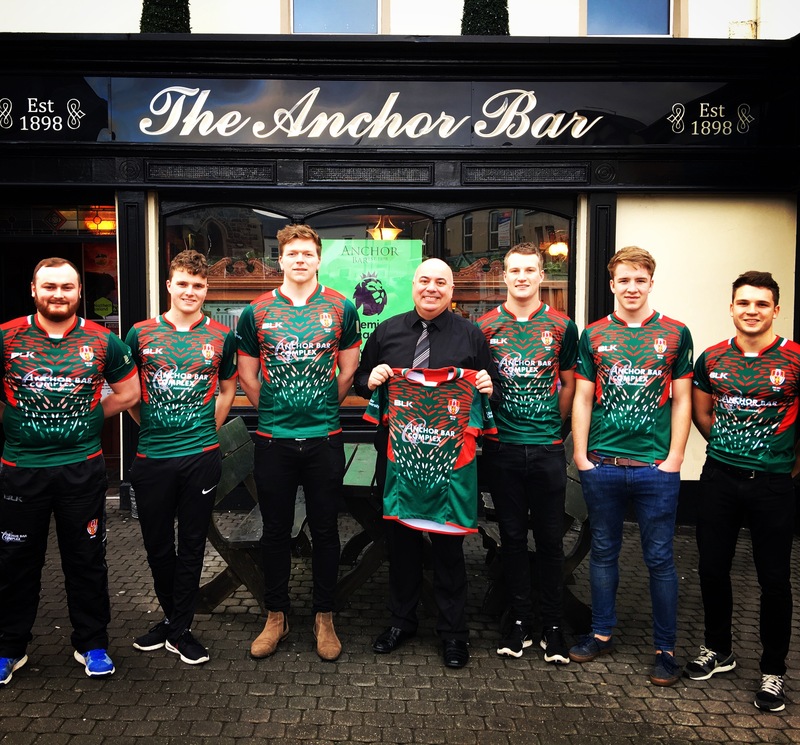 The Anchor Bar Complex, and Danny, have supported the UUCRFC for many years and we thank him for his continued support. Danny Coyles from The Anchor Bar Complex presenting some of the guys their new kit for the 2016/17 season. Have you applied to Ulster University for entry on September 2017? If so check out our TALENTED ATHLETE SCHEME. Successful applicants to the Talented Athlete Entry Scheme will be offered a two grade reduction. Those who commit to represent the University in their chosen sport will be offered access to support services such as fitness testing, strength and conditioning, performance development workshops and facilities. They will also get Scheme merchandise, Sports Union Club membership, physiotherapy support. Deadlines close on 15th January 2017. Any queries just message the page!! UUC Freshers after playing against UUJ at Coleraine on Wednesday. The team is coming on well and they look forward to a good season. Ulster University, in conjunction with Ulster Rugby, are running a female rugby #GiveItATry night on Wednesday 9th November at the Coleraine campus. The event is open to all females aged 15+ whether a school girl, university student, non-student, experienced player, local club member, far away club member, or a complete beginner wishing to give rugby a try. The focus for the night will be very much on the fun aspect of rugby and giving females a chance to play. The evening will begin with a short training session led by Ulster Rugby coaching staff. Participants will then be divided into teams to play games with both non-contact and contact rugby available on the night. 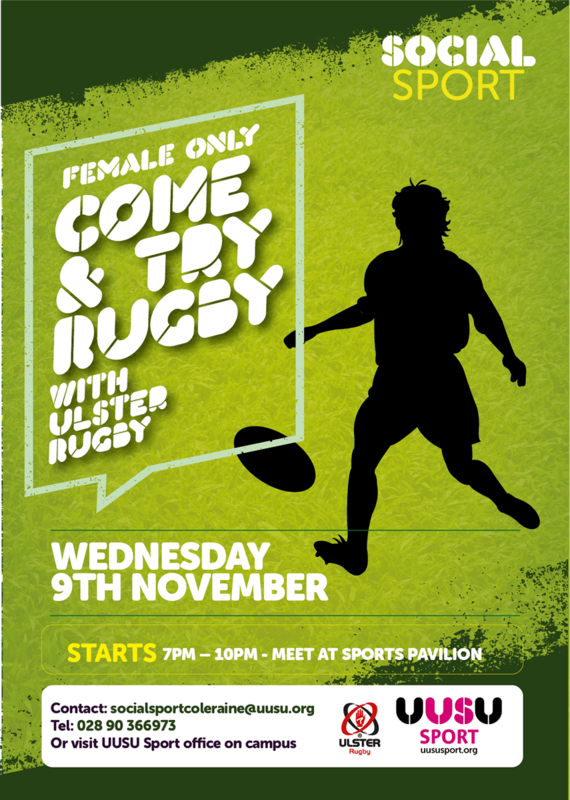 If you are interested in going grab a few friends or even just come down by yourself to the Sports Pavilion at Ulster University’s Coleraine Campus for 6:45pm on Wednesday 9th November. The session will start at 7:00pm with games starting around 7:45 and finishing once players have had enough. 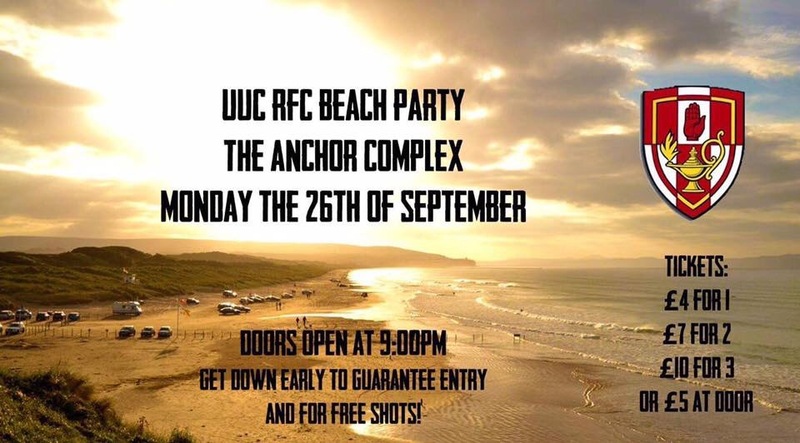 The UUCRFC Beach Party returns on Monday 26th September. Or £5 at the door on the night. All monies support the club throughout the year. This Saturday the UUCRFC 1st XV students travel to Limavady in thier second League match of the year. The students hope to finally overcome the Q2 League winners of last year although they know that it will be a hard battle. Kick off is at 1430hrs at Limavady Rugby Club. Call down and cheer on the men in green if your about. Have you applied to Ulster University? Successful applicants to the Talented Athlete Entry Scheme will be offered a reduction in entrance requirements of 40 UCAS Tariff Points. Deadlines close on Friday 15th January. Any queries contact the UUCRFC Offical Facebook page.